Like our software but can't buy it? Pay with your service instead! Look at Promo License opportunity. A software development tool, which manifests itself as the Template Designer (as well as the template language it visualizes). A run-time environment, which is the Template Interpreter / Output Generator. Template applications that implement particular end-user tasks (e.g. XML Schema Documentation Generator). Although, those pieces represent parts of the whole software system, essentially, they are intended for very different purposes. Therefore, not everyone needs all of them. Yet each of those parts cost great efforts to develop and cannot be given away totally free. Breaking the software into different editions does not solve the problem completely, because this cannot cover all possible usage scenarios: either someone will have to pay for what they do not actually need or we are forced to give away valuable features without any compensation for them (and, therefore, will have little funds to develop them further). The goal of this licensing system is to allow people to pay exactly for what they actually want to use and, at the same time, to keep the integrity of the software as a whole. That is achieved by introducing multiple licenses covering different groups of related features/functionality. These are called licensed entities. It works as follows. A particular software package is always the same and may include lots of functionality (for instance, FlexDoc/XML or FlexDoc/Javadoc). Without the proper licenses that functionality works only in a reduced or demo mode (see Demo License). When you want to use some set of features grouped under the licensed entity «A», you buy a Full License for «A». If you need more features that belong to the licensed entity «B», you buy another license covering «B». Both (or more) licenses can be installed together. As a result, you get software that does what you need and pay only for what you use. SDK (System Development Kit) First of all it includes the Template Designer – a high-quality GUI to create/modify templates. The «SDK license» covering it essentially provides a possibility to create/modify templates. Above that, SDK license may cover some extended functionality of the Generator (see below). SDK license may be a Demo, Trial or Full License. Template Interpreter / Output Generator This is the run-time environment to execute templates (called «Generator» for short). The result of its working is typically some number of generated output files (that is the output documentation). The most part of the Generator functionality is provided under the Free License. That is called «free Generator» and always available immediately as the Generator being run. However, some extended functionality (for instance, the possibility to execute trial templates) is unlocked only in the presence of a Trial/Full SDK License. Template Application Template applications implement what FlexDoc software is all about – particular documentation generators. Basic Templates, which implement some basic or sample functionality. They are provided under the Free License. Commercial Template Applications, which implement some general very complex tasks (e.g. XML Schema Documentation Generator). They are provided under a Demo, Trial and Full License. Custom Templates, which are those developed by users. First of all, to be able to create any custom templates, you will need an SDK license (trial or full). The SDK license also allows running any your custom templates. However, if you want to run them also with the free Generator, the SDK license, under which your custom templates were modified (i.e. saved) the last time, must be the Full one. Saying it simply, in order to use your custom templates, you need to buy a Full License for SDK (covering the Template Designer) at some point. Your custom templates were developed completely by you to solve your own specific tasks. In that case, you don't need to license anything concerning templates. Your custom templates were derived (by modification) from some templates developed by Filigris Works (which are included in the downloaded software). In that case, your custom templates are licensed under the same license that covers the original template application. Diagramming Plugin Diagramming plugins are special Java-hardcoded modules that generate graphical representations (i.e. charts, diagrams) of various things described by the data processed by the templates. Free License is provided for some Filigris Works software components to allow using them free of charge. The most important of such components is the Generator, which allows you to run the template applications. Others are Basic Templates. You may change the content of the generated files in any way you need, e.g. edit/remove some blocks, add your own, etc. You are free to distribute your generated/modified documents with no limitations. When, during the generation of any output files other types of licenses were involved, the whole result is governed by those licenses. Demo License is currently provided for some Filigris Works software components. Demo License is available free of charge once you have downloaded the software covered by it. The license is activated automatically each time you run the software (and no corresponding trial or full license found). No registration is required for that. Commercial Template Applications No limitations on whatever functionality. However, only limited number of major items (e.g. XSD components, Java classes etc.) are fully documented, which depends on the demo limits embedded in a particular template set (and main template) you run. When the demo limits are not exceeded (on small input data/projects), you will get the complete documentation without any distortions! Otherwise, some content will be omitted and the messages included saying which exactly limits were exceeded. Anyway, the result documentation will be minimally distorted to allow you to evaluate how everything would look under the Full License. Diagramming Plugins No limitation on whatever functionality. However, only limited number of diagrams is generated according to the demo limits embedded in a particular template set (and main template) you run, with which the plugin works. When the demo limits are not exceeded, you will get all diagrams! Otherwise, some diagram sections in the output will show up with omitted content and the messages included saying which exactly limits are exceeded. Anyway, those diagrams actually generated will be complete, with all possible hyperlinks and undistorted with any watermarks. So, you will be able to evaluate how everything would look when generated under the Full License. Template Designer You will be able to investigate any functionality, however unable to save any created/modified templates. Demo License has no limitation in time. You may use the software under the Demo License as long as you comply with the license terms. You are free to distribute your generated/modified documents and diagrams with no limitations. Demo License does not allow you to create or modify any templates. Template Designer will work only in demo mode. You will be able to investigate any functionality, however unable to save your created/modified templates. Trial Licenses are provided for those software components of Filigris Works that are available for Commercial Licensing. The purpose of Trial license is to allow you for free to evaluate all functionality you are interested in (and check that everything works properly as you expect) before buying the corresponding Full License. No limitations on the input data, number of documented items, number and size of the output files etc. A Trial License is generated automatically per your request and the license certificate is emailed to the provided address. The license certificate represents a plain text file with the information about your license. The received license file should be installed together with the installed Software according to the provided instruction. A standard Trial License is valid for 30 days. You may request for an extension of your Trial License for another 15 days (30 days). However, that possibility may be limited. Any output files generated under one or multiple Trial Licenses may be used for evaluation purposes only. You are strictly prohibited to use the generated documentation (or any parts of it, including diagrams) for any other tasks. where you can see, which trial licenses were used (involved) in the generation of that particular document. As soon as you acquire the corresponding Full License(s), no text distortion, trial messages or watermarks will appear! You may create/modify any templates under a Trial License that covers the Template Designer (i.e. SDK license). In some texts on this site, the Full License also referred to as «Commercial License», and the software components, to which it is available, – as «commercial» ones. Under this term, the Software provided by Filigris Works is licensed to a specific individual person or legal entity. The Software is priced on a per-user basis and any license specifies the authorized number of users, the licensee name, organization and e-mail address. Each Full License is a floating license. It means that the license may be installed on any number of computers and used by any number of people, provided that the number of concurrent users never exceeds the number of licensed users. FlexDoc Software currently does not include any specific license manager that checks the number of concurrent users. You should ensure this by yourself so as to comply with your license. If you cannot control it you should buy more licenses (e.g. for each of the potential users)! The Software (or any part of it) licensed under the Full License may not be redistributed separately or as a part of any other application. However, any output produced by the Software (including the template files created with it) may be freely distributed without limitations. The Full License permits of using it to only a specific individual person, who purchased the license, or members of the licensee company/organization as a single legal entity. The license may not be transferred to any other company/organization or individual, except the direct successor of the licensee who takes over the full legal rights and responsibility over the licensee business. The Software is only available through electronic delivery via Internet (see downloads). The fully functional version of the Software is unlocked by the license certificate (key) sent to the user via e-mail to the specified e-mail address. The license certificate represents a plain-text file with the information about the license and the licensee. The license file should be installed together with the Software according to the provided instruction. Unlimited email support for a period of one year. The unlimited support means that you will normally get a reply on your e-mail during the same or the next working day, and we will keep corresponding with you until you have all your questions or problems fully resolved. Free bugfix updates for the licensed version of the Software (see also below). If you report us a bug and provide with some information about how and where that bug is happening (in most cases, just a full Java Exception Stack Trace would suffice), normally, we can fix it and prepare an update during 2-3 following days. In fact, we have been very rarely reported about bugs, so that was experience from those few cases. The owners of Full Licenses are eligible for free upgrades within the same generation (major version) of the licensed Software product. For example, if you purchase a license for the Software version 1.0, your license is automatically extended to versions 1.1, 1.5.1 and so on. To upgrade to a new version within the same generation, you need just to download the new software from our web-site and install it along with your license certificate. Each new software version is designed and tested to support any early issued licenses covering it. You are free to distribute your generated/modified documents/files with no limitations. Any text distortion, which you may see within the documents generated under the Trial License, will disappear once you have installed the Full License. However, if during the generation of some files any Trial Licenses were involved, the whole output is considered as the trail one. To execute any trial templates (without any limitations). To distribute your custom templates to anyone else. In order to run any custom templates derived from a CTA, additionally, a Trial/Full License for that CTA is required. Promo License is an equivalent of Full License and can be given to anyone for free. Instead of paying cash, you are required to help us promoting our software on Internet (particularly to search engines). Publish an article (on whatever topic you want) at one of the high-ranking sites (like dzone.com or medium.com), in which you mention our product with a direct link to its home page. Send us the link to that article then! If you are able to do that, we will grant you a permanent Promo License (the full equivalent of the commercial one) covering all features of the given product line (e.g. in case of FlexDoc/XML that will be an equivalent of 1250 EUR). Some text (annotation), in which you describe how you use our software and for which features you prefer it. The text may be short, however it must be intelligible and related to both your project and our product. A documentation generated by our tool with the links to the tool's home page (inserted automatically by default). Such a documentation can by produced initially under the Demo License. When you succeed, send us that query (using which we could reach your page with the links to us through Google). As soon as we have that, we will send you 1 year Promo License for our product(s) referenced with the link(s). You must be also committed to keep that link (listing, review, testimonial, documentation) online accessible to search engines for a period at least 1 year. Using of Basic Templates requires no specific licensing. You are equally free to modify such templates and base on them your own template applications (see Custom Templates). Commercial Template Applications (or «CTA» for short) are large template sets developed by Filigris Works to implement certain general very complex tasks. They provide the functionality, which is typically offered by other companies in the form of separate commercial software products (or specific features of them). For example, “FlexDoc/XML XSDDoc” template set implements a high quality XML Schema Documentation Generator. It means that anything the template application is able to generate is programmed entirely within the templates themselves. The template interpreter, the template language and its embedded functions provide only a general basic functionality needed for a particular application field (e.g. XML). For instance, FlexDoc/XML by itself does not “know” anything about specific features you can see in the XML schema documentation generated with XSDDoc templates. Everything is programmed within the XSDDoc templates. That allows you to quickly change something in the output documentation only by modifying a few related templates. See also: Custom Templates. Since FlexDoc templates always require a special interpreter for their execution, all CTAs are delivered as add-ins to each edition of the base product line. For example, the XSDDoc template set is included in FlexDoc/XML archive. On the other hand, because CTAs actually solve some very complicated general tasks, they require separate licensing. So, each CTA has its own product name and version number, to which a license is attached. No limitations on whatever functionality. However, only limited number of major items (e.g. XSD components, Java classes etc.) are fully documented, which depends on the demo limits embedded in the template set (main template) you run. The output documentation generated by a CTA working under the Demo License is free for any possible use. Full License This license unlocks all functionality implemented in the CTA, with no limitations on the input data, number of documented items, number and size of the output files etc. Trial License This license unlocks all functionality implemented in the CTA, with no limitations on the input data, number of documented items, number and size of the output files etc. All output document generated by a CTA under the Trial License will be specifically distorted and contain trial messages at the end of each file. Any generated files may be used for the evaluation of this software only. In this category fall all templates that were created or modified by the users working under a Trial/Full SDK license (that covers the Template Designer). Any templates developed completely by the users to solve their own specific tasks. Any templates derived from Basic Templates (i.e. produced by the modification of one or several templates included in a basic template set). Any templates derived from CTAs (i.e. produced by the modification of one or several templates included in a commercial template set). Custom templates created (or modified the last time) under the Full SDK license may be executed anywhere, including by the Generator working under the Free License. Custom templates created (or modified the last time) under a Trial SDK license are called trial templates. Any trial template may be always executed in the presence of a Trial/Full SDK license. To make trial templates executable with the free Generator, they must be cleared from being "trail", that is updated (resaved) with the Template Designer working under the Full SDK license. If you derive your custom templates from a CTA, in order to run them, you will need also Trial/Full License covering that CTA. License for FlexDoc/XML XSDDoc – covers «XSDDoc» (the CTA implementing the XML Schema Documentation Generator). In general, FlexDoc templates should be edited using the Template Designer. Although, the templates are plain-text files with the format looking somewhat similar to XML (see FlexDoc.XYZ | What are Templates? | About Template Format), there are several reasons why we do not encourage changing templates manually. One of such reasons is that because of the licensing issues the template structure and content are locked with a special checksum. This prevents easily forging the templates in order to circumvent licensing terms. However, when you need to quickly replace a certain string simultaneously in a number of template locations or translate lots of text labels into a different language, doing this by changing the templates in a simple text editor might be much faster. Once you have changed anything mentioned above directly in the template source, the template checksum will be partially broken. However, you can execute such a template with the Generator. When you resave the template with the Template Designer, the correct checksum will be restored again. If you change any other template settings manually (e.g. definitions of template components), the template checksum will be broken irreversibly. After that, it will be impossible to process anyhow such a template (including opening it in the Template Designer). The same will happen if you spoil the template syntax! Because of this, we strongly recommend to backup your templates before editing them manually! You may combine (install) several licenses covering different features so as to use all of them together. For instance, along with a license for FlexDoc/XML XSDDoc – the XML Schema Documentation Generator, you may install a license for FlexDoc/XML DiagramKit – a diagramming plugin that generates XSD component diagrams. 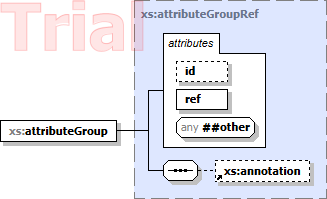 As a result, you will get a generator of XML schema documentation with diagrams. Those licenses may be of different types. You may have a Full License for some feature you've been already using for a while and additionally to install a Trial License for another feature so as to try some enhancement of the functionality you already use. However, those combined licenses may have contradictive restrictions. So, the question arises: If licenses of different types impose different restrictions on the generated output, which of those restrictions apply to the output files generated under all those licenses? When to unlock all necessary features of the FlexDoc software several licenses are installed and some of those licenses have different types, the license that imposes maximum restrictions and obligations will have the highest priority. For example, when some output was generated simultaneously under both Full and Trial Licenses, that will be considered a trial output with all restrictions implied by the Trial License. An employee named Joan of some imaginary company called PerfectSoft Ltd. needed a good XML Schema documentation generator for her job task. She found one called “FlexDoc/XML XSDDoc” at this website. It happened to be a set of templates included in a software package “FlexDoc/XML”. When Joan downloaded that software and investigated it, she realized that that was exactly what she needed. Joan read that if she purchased a Full License for FlexDoc/XML XSDDoc, she would be able to generate a complete framed HTML (Javadoc-like) XML schema documentation that she needed right then. 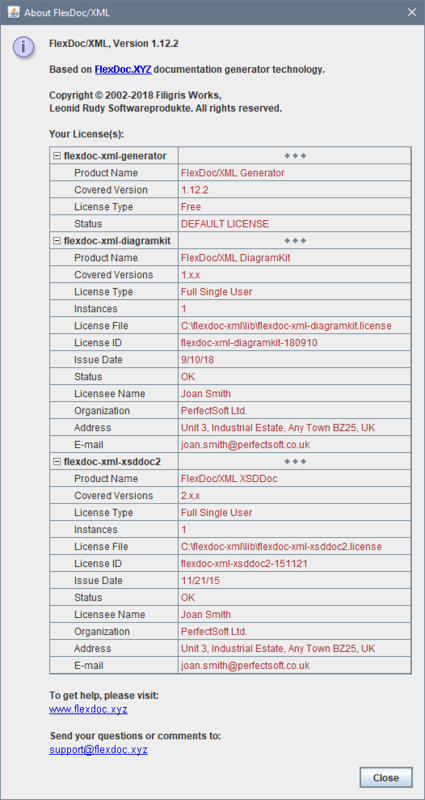 So, Joan asked her company to buy a license for FlexDoc/XML XSDDoc.